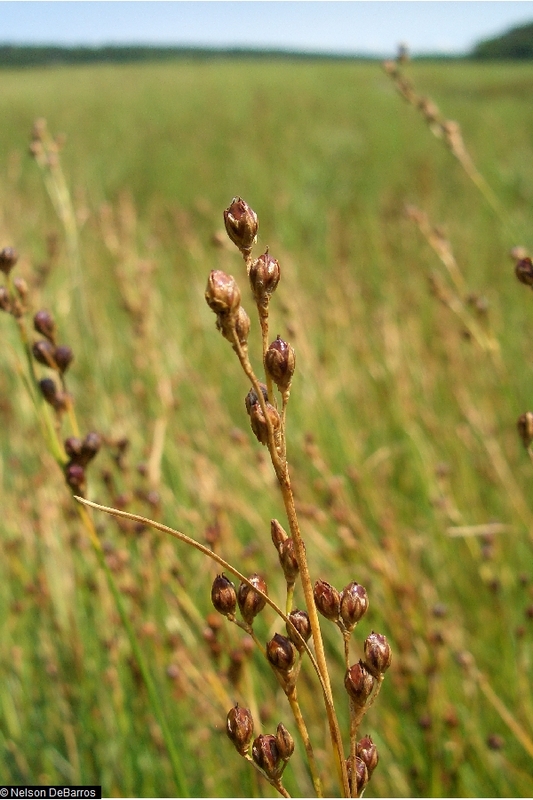 Juncus gerardii.© Nelson DeBarros, hosted by the USDA-NRCS PLANTS Database (Accessed 9/2014). Juncus gerardii is a perennial, C3 rush (Theodose and Roths 1999) 20-60 cm tall, in small tufts, colonial from rhizomes. Leaves of stems 1-2, to 20 cm long, sheath of upper one extending half-way up stem, top of sheath entire, blades rouded. Flowers dry, radially symmetrical, purple-brown, 3-parted, about 0.3 cm long,not in heads, petals and sepals alike, in two whorls, very distinctively dark, stamens yellow or red, stigma pink with white edges; inflorescence bract shorter than top of inflorescence. Fruit dry 1, hollow, about 3 mm, top rounded, slightly larger than petals, many- seeded. Habitat: Upland boundary of high salt marshes (Theodose and Roths 1999) and open, wet disturbed areas, fill. Notes: Plants eaten by rabbits (Martin et al. 1951), seeds probably eaten by birds. Much like J. tenuis, but inflorescence bracts shorter than inflorescence.